A 25,000 mile diameter sphere was hanging in a vacuum..really, by accident? When you see a modern aircraft fly over, (or a classic like the P-38) you would ever question that this technological wonder, a result of wise and thorough planning required Intelligence acting upon matter to be built and fly. But when you see a bird fly by and think to yourself, ‘what a beautiful creature! ', what about where it came from? Some say birds were self-made by time and accidents, pretty amazing, but is that really true? Like this aircraft, can there really be a 'watch without a watchmaker' in the world of biological life? And if so, what proofs are there of this intelligence? That’s the topic of this website, so please read on. 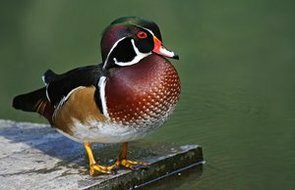 Looking closely at the coloring of this wood duck, its deep hues and perfect lines, ability to fly, navigate and fuel itself, how could accidents and time paint such a beautiful animal without a guiding hand? All man's best efforts to canvas such a image fall short, so if the concept of evolution is so scientifically sound as many claim it is, shouldn't we be able to understand how evolution works, scientifically? And don't forget, Mr. Wood duck here also has the ability to replicate and repair itself, two things no aircraft can do! Our beautiful Planet, a work of accidents or Design? 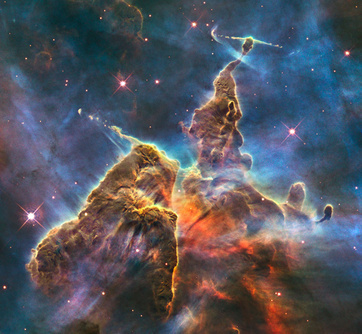 According to many science texts, the earth was formed billions of years ago after gasses and matter collected in space and self-assembled into our living planet. 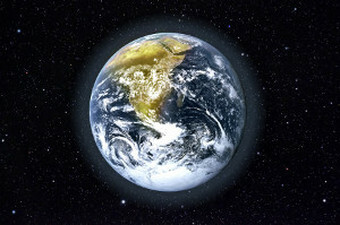 Then all the substance forming our rivers, oceans, land mass, atmosphere and minerals all self-sorted into Earth - they say. Can the order, cycles and beauty of this planet truly be explained this way? Or, was there an outside guiding force involved? Think of all the mineral resources available for people to use to make life simpler, safer and more enjoyable here. Isn't it amazing each of these vital resources are distributed quite evenly on each continent? And what about the lack of excess harmful elements (like arsenic or uranium), that would prevent life on Earth to exist? Is this a combined accident due to the probabilities, eons of time or the vastness of space, or is there more to the story? Now think about it, our Earth suspended and floating in space with a moon at just the right orbit to create tides, without which the oceans would be one big stagnant pond! 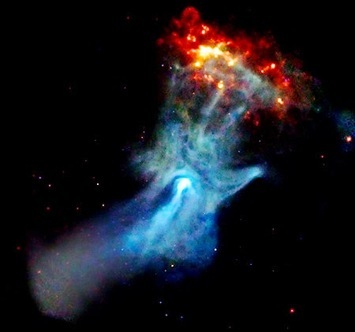 Space is where the Creator may safely show His creativity and Power without harming us as below. of Sun, Earth and Moon. We enjoy a livable range of temperatures and wind velocities on the surface of Earth because of this balance, and, like liquid water, found nowhere else because we have an atmosphere. 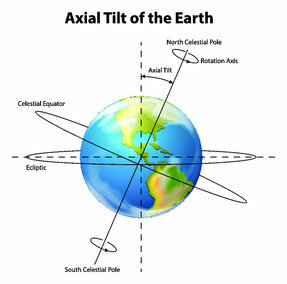 As in the diagram, the Sun and Earth relationship alone is astounding, but adding the Moon to the equation demands, logically speaking, that intelligence was involved, there is no other explanation, the mathematical probabilities for this happening accidentally are just too high. The Moon takes exactly 27.3 days to rotate once, and this is exactly how long it take's the moon to orbit earth! This type of motion acts is a built-in gyro that keeps our orbit very stable. The Moon also orbits us in a way to eclipse the Sun. It also appears nearly the same size of the Sun from our perspective on earth and provides a great nightlight. Further, the Moon is 400 times smaller and also 400 times closer to Earth than the Sun to allow an eclipse. Old Solar System? Not according to the Moon - we now know it moves away from us about 1.5"/year. If you extrapolate that mathematically, the Moon would have been in close orbit only millions of years ago! We should be thankful that an Intelligence designed such a perfectly working system for our well being on Earth. (1) See this section for much more information concerning the "Time" issue The Question of Time - Genesis Alive! Our Atmosphere protects us from the Suns harmful rays, and wonderfully provides a reflector for light, otherwise we would standing in darkness similar to the moons surface! Watch a meteorite shower some night and consider these deadly projectiles are being evaporated right before your eyes, like a shield from Star Trek! The Sun, like the Moon, is just the perfect distance from us also. Can this be another accident? Slightly off! This long established dogma, all wrong! Doesn’t this illustrate that secularists are willing to 'believe' as needed to explain their concept of the Universe? Such a faith in the unobservable tells of their true bias and absolute; To understand all nature, without God. And yet many of those same secularists would reject a belief in God on the basis that He cannot be observed! Even the world's largest particle separator CERN searched for Dark Matter and failed. (2) Interesting enough, at the same time the group announced the isolation of the final particle in the Standard Chart - the Higgins Bosin God Particle. We should be very discerning of these claims and theories we see in the media, as they waver back and forth Vs the facts. It should be noted a Peruvian Observatory dared to challenge the prevailing Dogma on Dark Matter, (1) as no American Institution would dare touch the subject. Why is this important? Because we believe you are living in a Vital and Personal Universe created for you to observe, enjoy and live in. Back to the earth biology origin story, evolutionists teach ponds formed where various chemicals collected and from such, these chemicals, parts of biochemical forms spontaneously occurred that led to self-assembly of amino acids (the building block of some proteins, cell material). After more time these amino acids self-assembled into proteins, (they claim) then cells, the building blocks of life. But wait, the leap from a protein to a cell is like saying we have aluminum and then sprang forth a 747! That’s a small statement about a big thing when speaking of life and origins. For more on this topic see - The Question of Complexity - Genesis Alive! Magnetism Theory gains support - See More in The Noah Code! 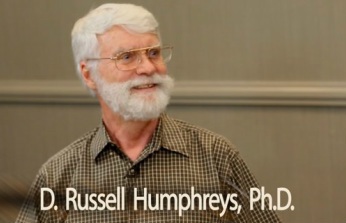 Dr. Russ Humphreys, a physicist who's worked at Sandia National Laboratory for over 20 years, postulated a theory in 1984 concerning rapid magnetic decay of planetary and now Galaxy-sized magnetic fields. His theory asserts that the combined hydrogen atom alignment's creates magnetic fields suggests that God aligned hydrogen nuclei in the originally-created water of such bodies, creating magnetic fields. The nuclei would quickly become disaligned, and God would then have transformed them to other types of nuclei, but the magnetic fields would be preserved. and these fields would rapidly run down for smaller planets, since their creation, less than 6,000 years ago. His mathematical formula's quantitative predictions have now been proved out, in shown accurate by three NASA probe missions - Voyager II in 1975, Mariner 10 in 1990 and more recently, Messenger in 2008 through 2011. His theory, inspired by Thomas Barnes in 1971, and the Bible, traces measurements made back as far as 1835, showing the earth’s magnetic field is rapidly collapsing at with a 1400 year half-life rate. For those of you who are pilots, you will recall aeronautical charts go obsolete in just 90 days, one reason because the isogonic lines drawn on the maps depicting magnetic variation change rapidly. Russ understood Mercury has the most intense and rapidly collapsing magnetic field in the solar system, determined from earlier spacecraft data. "Mercury’s decay rate is so rapid that some future probe could detect it [a change] fairly soon. In 1990 the planet’s magnetic moment should be 1.8 percent smaller than its 1975 value [measured by the Mariner 10 spacecraft]. " Humphreys states. As the results came in, Dr. Humphreys was amazed, validating his theoretical plots and showing this planets field strength changed with these flyby's, even spaced so closely in time. To better understand the physics involved, Creationist theories of planetary fields expect such a decrease because electrical resistance in a planet’s core will decrease the electrical current causing the magnetic field, just as friction slows down a flywheel. The smaller the core or greater the resistance, the faster the field will decay [like Mercury]—and the decay is exponential (constant percent decrease per year. The 2012 vindication, all five predictions play out! : Magnetic fields in the cosmos serve as God’s signature on his creation, and like everything in the heavens, they give glory to Him (Psalm 19:1). Measurements MESSENGER made from orbit compared with the 1975 Mariner 107 data, show that Mercury’s magnetic field has weakened by nearly 8% in the past 36 years, an astonishingly fast decrease. That supports a [his] prediction in the 1984 paper: “Mercury’s decay rate is so rapid that some future space probe could detect it fairly soon. In 1990 the planet’s magnetic moment should be 1.8 percent smaller than its 1975 value.” The observed rate agrees with Mercury’s core having an electrical conductivity close to that of Earth’s core.8 The next issue of Journal of Creation9 will give more details.The fast rate of decay (half-life of 320 years) implies the crust was magnetized only thousands of years ago. The above two items for Mercury’s magnetic field, its fast fading and its magnetized crust, complete the five predictions in my 1984 paper, all of which spacecraft have now verified.10 Also, I have extended the application of the theory to other astronomical objects inside the solar system (asteroids, meteorites, moons of other planets) and outside the solar system (stars, magnetic stars, white dwarfs, pulsars, magnetars, galaxies, the cosmos itself). Amazingly (at least for me), this theory fits these objects well, too. "11 A good theory will survive repeated field testing and if applicable, should have predictive capability, Dr. Humphreys 2008 statement: "There is also a possibility that the true value of the 2008 field is even lower than the prediction" has also come to pass, and In my opinion, this work is eligible for the "science" category and should be published. As for long age theroies Russ also predicted in 2008: "I predicted four percent decrease in only 33 years would be very hard for evolutionary theories of planetary magnetic fields to explain, but a greater decrease would be even harder on the theories." It appears that Dr. Humphreys estimates have been improved upon by 100%, as the new values have come in at a whopping eight percent change is just 33 years! From Poisons to complex and functioning life? When scientists like Miller attempted to duplicate this process in 1952, they did get acids, more accurately lethal poisons! “It has become apparent that organizing simple molecules into assemblies capable of reproducing and evolving is a far greater task than was generally realized during the excitement that followed the experiment”. (1) Note that they added just the right chemicals known in an amino acid to get this compound, but were stopped cold as far as any life-making goes. Now as these stories are told and retold with artist conceptions of self-making life, cell's start springing from the textbook pages and into our minds as a “probable” explanation's that eventually become beliefs. Such experiments have long been suspended as failures. The "unlocking" videos below offer an excellent overview and conclusion of the origin of life question. 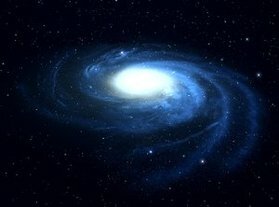 See The Question of Complexity - Genesis Alive! for more on this topic.